Discussion in 'Present & Current Events' started by Toroid, May 29, 2018. If I stop bathing and shaving regularly do you think Pam Anderson will visit me? Yeah, I saw that. Swine. Unlike most somebodies there's plenty more something where that came from. Wellwishers have donated more than $300,000 to the family of a five-year-old boy who suffered life-threatening injuries (top right) when he was thrown off a third-floor balcony in the Mall of America (bottom right) by a stranger. Friends of the family began a GoFundMe crowdfunding campaign for Landen, who is described as 'the sweetest, kindest 5-year-old you will ever meet'. Police say Landen was tossed from the balcony on Friday by 24-year-old Emmanuel Deshawn Aranda (far left), who is from the Minneapolis metro area. Aranda was charged with attempted homicide and is currently being held at the Bloomington Police Department. 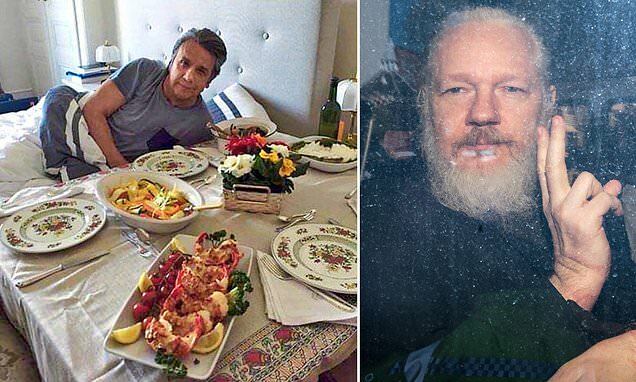 It has emerged Julian Assange's expulsion from the Ecuadorian embassy came after embarrassing photos were leaked of the Ecuadorian President Lenin Moreno eating lobster in bed (left, and Assange is carted through London by police, right). The image caused great embarrassment to the South American leader whose people are struggling under his imposed austerity measures. Mr Moreno has accused Assange of leaking the material, a claim which WikiLeaks has always denied. On Thursday, as Assange was being dragged out of the embassy, Mr Moreno told reporters he did not have the right to 'hack private phones'. You would think he wouldn't be so dumb as to bite the hand that feeds him...but you never know. It looks like he got cabin fever. A billion people watched GoT season eight premiere. The current world population is 7,714,576,923. It aired in 207 countries. Loughlin (pictured left arriving home after filing court documents) and husband Giannulli said in the documents filed Monday that they are waiving their right to appear in court for an arraignment and plead not guilty.The couple (pictured above right) and more than a dozen other parents were indicted last week on charges of mail fraud and money laundering conspiracy. Loughlin and Giannulli are charged with paying $500,000 in bribes to get their daughters (pictured with Loughlin bottom right) admitted to the University of Southern California. I think they made a big mistake by pleading not guilty. They would have been better off making a deal. It's almost a certainty they won't get anything close to 40 years. The couple have pleaded not guilty to charges related to allegedly paying William "Rick" Singer $500,000 to get their daughters, YouTube star Olivia Jade and aspiring actress Isabella, into the University of Southern California (USC). The girls reportedly posed as crew team recruits despite not being coxswains. Insiders told Entertainment Tonight that Loughlin felt deceived by Singer, scam mastermind-turned-cooperating witness, about the severity of what she and Giannulli were doing. "[Lori and her husband] claim they were under the impression they might be breaking rules, but not laws.They feel they were manipulated by those involved and are planning that as part of their defense," a source told the outlet. "They realize how serious the charges are, but feel that once the judge hears their story he will see they had no bad intentions." Their attorney should inform them that's a very weak defense. Ignorance of the law isn't an excuse to break it.